I recently faced a conundrum and blogged about it on my website but I wanted to go into the subject in greater detail, having given it some more thought. 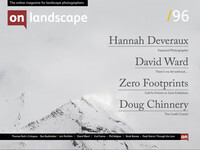 I wanted to stimulate a discussion among other, wiser photographers than me, here at On Landscape. I am looking for answers as much as anything else. The issue is about giving credit for our inspiration and the influences in our work. Should we? Shouldn’t we? How far should we go - should we mention them every time we post an image, or just on our ‘about me’ page on our website? Perhaps we see the influence of many others in our work; should we mention them all? Every time we show an image? Where do we draw the line? Is there an accepted etiquette amongst photographers in this area? Let’s be honest, we all copy. We might prefer to say we are ‘influenced’ or ‘inspired’ by the work of others, but it really boils down to copying to a greater or lesser extent. Indeed, Picasso famously said ‘good artists copy, great artists steal’. This cryptic quote seems typically controversial. I have seen various explanations as to what he meant. Some say he felt that artists who are ‘just’ good simply copy the work of others who have gone before them. Whereas, great artists have the ability to find work by others that has gone unnoticed and yet holds creative merit and this they ‘steal’, claiming the glory for themselves because of the anonymity of the previous artist. Another explanation is that ‘good’ artists are only capable of seeing the work of another and duplicating it, whereas a ‘great’ artist would steal an idea, seeing some potential in it but, crucially, they would change it in some way, add to it, move it, split it, combine it, to put something of themselves into it, to make it uniquely their own. Whatever Picasso meant, the truth is there is almost no image that can be said to be truly original, whether a photograph or a work of ‘art’.